TerraPower’s Travelling Wave Reactor – why not use an IFR? Wave of the future: Unlike today’s reactors, a traveling-wave reactor requires very little enriched uranium, reducing the risk of weapons proliferation. The reactor uses depleted-uranium fuel packed inside hundreds of hexagonal pillars (shown in black and green). In a “wave” that moves through the core at only a centimeter per year, this fuel is transformed (or bred) into plutonium, which then undergoes fission. The reaction requires a small amount of enriched uranium (not shown) to get started and could run for decades without refueling. The reactor uses liquid sodium as a coolant; core temperatures are extremely hot–about 550 ºC, versus the 330 ºC typical of conventional reactors. Further details are given here at NEI Nuclear Notes, and you can watch an animated video here. Thanks Barry, I agree that IFR is a better sodium cooled fast reactor than TWR. I’m still scratching my head what the advantage to TWR is in the first place. Just to be clear–LFTR is a breeder, it’s just not a “net breeder” or a “doubler”. It’s an “iso-breeder”, producing enough fissile to keep itself going essentially indefinitely. Only reactors based on fast spectra and plutonium will be able to achieve high breeding gains. But thermal-spectrum “isobreeders” like LFTR have low fissile inventories that allow many to be started for a given fissile supply. I was assigned to it but did not go. There are others around who know about this who would most likely agree with these comments. I do not have enough info to contribute, I was only involved very briefly. I agree with DR. Stanford’s post. The TWR reminds me of Oppenheimer’s “Nuke in a Hole”. The idea was to bury it and then abandon it 30 years later when the fuel was exhausted. Presumably the TWR is designed so that the core can be recovered. Thank you for this excellent analysis by Dr. Stanford. Kirk, thank you for confirming my impression that LFTRs are very low gain breeders. This would be great when there’s a large fleet of reactors but isn’t what we need for creating the fleet. The TWR reactor sounds to me like a solution to the wrong problem. Enough said. I like the suggestions for what to call reactors. How about also calling a burner or sustainer reactor ‘full burn’ when it burns close to 100% of the fertiles/fissiles in the fuel. Is there any theoretical limit on the maximum percentage of burn, or is it like half life, with an asymptote? Another issue on words, too. I’d like a better way to describe what now comes out of conventional LWRs than ‘spent nuclear fuel’. Calling it ‘spent’ doesn’t cut it when less than .7% of the energy in the source uranium has been concentrated and extracted. Now a question for the experts. The LFTR seems to have a lot of advantages by virtue of using liquid fuel, which (among the advantages) allows continuous extraction of materials from the core. Is a molten salt or liquid fuel fast uranium breeder design possible? Are there ‘gotchas’ in physics or chemistry that make it impossible? Or is it more an engineering challenge? In my imagination, I see extracting the valuable fission products (as NNadir says) and bred fissile excess continuously rather than in batch operations at refueling times. I tried some searches in Google Scholar for molten salt uranium reactors. The only one seems to be original ORNL molten salt reactor, which wasn’t conceived as a uranium breeder. It started with a 235U charge and then bred thorium to 233U as a sustaining reactor. I’d love to know if there’s been work on a fluid fuel uranium breeder. In any other area of energy, a power plant that creates energy and fuel simultaneously would be big news. And in case anybody needs another challenge – could a liquid fuel uranium breeder be later converted to run as a full burn thorium sustainer? I suspect the core designs would be too different because of the different neutron spectrum requirements, but I know I’m speaking from ignorance. I welcome enlightenment. Thanks again to everyone for your excellent and inspiring work here! “Ash-choked nuclear fuel” is exact. On the terminology issue, burner reactors as defined above by Joffan, are usually referred to as ‘converters’ in the literature, for some reason, although ‘burners’ seems a better term to me. ‘Sustainer’ is problematic, as such a reactor is balanced on a knife-edge. A fractional underperformance, and it will run out of fissile and shut down, a fraction over and it is a breeder, albeit with a doubling time so long it is irrelevant. In practice, to allow for inevitable lossses in the reprocessing system, any reactor intending to be sustainable on abundant U-238 or Th-232 must be a (marginal / minimal / bare / pick-a-term) breeder. A liquid-fuel uranium breeder is possible, using sodium chloride (enriched in Cl-37) as the carrier, with UCl4 / UCl3 / PuCl3 dissolved in it. Such a reactor needs a fissile inventory of 7-8 Te / GW(e), similar to an IFR, but it’s all in the core at once, rather than half in use and half being cooled and reprocessed. Breeding performance and doubling time should be slightly better than IFR. However, this is a ‘paper reactor’, or at least an entirely virtual one. No such reactor has ever been built, not even a small prototype, so time-to-market would be long, and uncertain. Thanks for your reply. I think we definitely need to go with fast time-to-market reactors. There’s a fascination with fiddling with ideas and everything that can be labeled ‘new and improved’. I can see it in every news story that stretches to make everything be the next hot idea for combating global warming, ocean acidification, and the whole list of hot buttons. It’s time to do things that work. Hello George, it is great that Bill Gates recognizes the need for nuclear power to solve the world’s energy problem. It is unfortunate that he has latched onto the Rube Goldberg TWR. The advantages are hyped and the disadvantages are glossed over. In addition to the issues you raise consider these. Imagine you run an airline and someone offers to build an airplane that only needs refueling once after 60 years. Great, you can fly it round the clock for 60 years. But wait, you still need to perform annual maintenance checks, change the tires, brake pads, hydraulic fluid, pack wheel bearings, upgrade instrumentation and control systems replace time limited components etc, so capacity factor will not increase as much as you might expect. In the reactor world lots of work goes on during refueling outages besides refueling, so maintenance outages will still be required for the TWR. The capacity factor of the TWR will be similar to that of conventional plants. Do you pump coolant through the entire core for 60 years? That will require much bigger pumps that will burn up a lot of kWh’s you cannot sell to customers. Or do you put in a flow control system to direct coolant to the active region. That would involve substantial mechanical complexity. The huge core will require a massive complex control system to monitor and regulate the distribution of power in the core to generate the required amount of power while staying within fuel rod peak power limits. Any compromise in reliability will rapidly eat up any savings. The massive core will require a massive foundation and associated building, increasing capital cost and construction time. At this time we really do not need a breeder reactor that solves all our energy problems for millions of years to come. We really need a simple safe efficient design that can produce energy cheaper than burning coal, and be factory mass produced in unlimited numbers quickly and at low cost. The most likely candidate is the dirt simple Molten Salt Reactor using a once through uranium fuel cycle. They are easy and cheap to mass produce; they are inherently safe and use uranium 4-6 times more efficiently than conventional reactors. That should be our goal, a solution the entire world can implement at a cost much lower than burning fossil fuel, and we should be spending all available resources pushing R&D of all possible energy technologies that have the potential to produce reliable, safe, dispatchable energy that is far cheaper than burning fossil fuel. Of the known technologies I think the simplest MSR has the highest probability of meeting our needs for the next few hundred years, but if something better comes along that would be great. For a quick introduction see Dr. David LeBlanc’s slides. For the details see his talk. I’ve given this some thought, and here’s my assessment. First of all, some people view *any* form of nuclear fuel recycling as a non-starter, at least for the near future. As far as they’re concerned, the IFR is not an option. In spite of that, improving uranium utilization is still a major incentive for using fast reactors. Current LWRs utilize less than 1% of natural uranium. By comparison, a fast reactor can achieve perhaps 20% with a single pass without recycling. In order to achieve this utilization, extensive breeding is required. It is preferable for the breeding occur away from the immediate vicinity of the fissile fuel to slow the reactivity increase from the breeding. This is achieved using “blankets” of fertile material (as opposed to relying on local breeding in the fissile fuel rods). However, these blankets generate plutonium with a very high concentration of Pu-239 (or U-233 if using thorium). The potential proliferation hazard of this material can be mitigated by never opening the core for refueling during operation. Further, because the core will operate for 40 years or more, this defers the decision to recycle the fuel by at least that long. At this point the politics, economics, and technology may be different. Put all of this together and you invariably end up with something like the TWR. Andrew, I’ve collected a fair number of papers describing the fast-spectrum, liquid-chloride reactor concept that is the molten-salt analogue to the IFR. They can be found on my document repository near the bottom of the page. The single best one to read is probably Ottewitte’s 1992 proposal to INL (INEEL at the time). Look for the section called “liquid-chloride reactors”. To get a better idea of what Gates thinks he is doing, people may want to listen to his own words. Your quote isn’t from Gates, its just a blurb from the website that contains the video and transcript. His TED talk is here: http://www.ted.com/talks/bill_gates.html The transcript in interactive, in that you can read, then click on a word, which moves the video to the point in the transcript you clicked on. Bill defines “miracles” in a way differently than most. He’s calling on the innovators of the world to take on the challenge of creating zero emission energy sources that will cost less than coal power. One questioner said: “It’s a nuclear power plant that is its own waste disposal solution”, and Bill said: “Yeah. Well, what happens with the waste, you can let it sit there — there’s a lot less waste under this approach – then you can actually take that, and put it into another one and burn that. And we start off actually by taking the waste that exists today… That’s our fuel to begin with”. People criticize Bill for calling for research into energy “miracles” when what we need to do is to start implementing what we know how to do right now, but these critics misunderstand. Bill wants government funded research beefed up, in addition to implementing what we know how to do now, so that by 2050, we’ll be able to get to zero emissions in enough sectors and countries that the planet will remain inhabitable. Bill notes that military and health research dwarfs energy research, and he calls for government funded energy research to be beefed up to a more respectable level, still lower than health or military. He says its energy $4 billion now, health around $30 billion, and military $80 billion. He wants the energy portion to move to $14 billion. What is important about Gates is he is a leader who has recently recognized that climate is the problem of our age, he understands that we need to emit zero GHG in every sector where this is remotely possible, he understands that we need to do it as soon as possible, and he is calling out to his peers to study this issue and get on with finding solutions. iirc, the company designing the TWR, Intellectual Ventures, has paired up with Toshiba which will help with the development. Apparently, 80% of the technologies in the Toshiba 4S can be applied to the TWR. Shouldn’t we be happy for a design that is much better than the LWR and is a step closer to the IFR? Wow – that’s a lot of material. I have been at your site (it’s one of the first I was exploring) and didn’t go far enough. Thanks! Good to have you here. 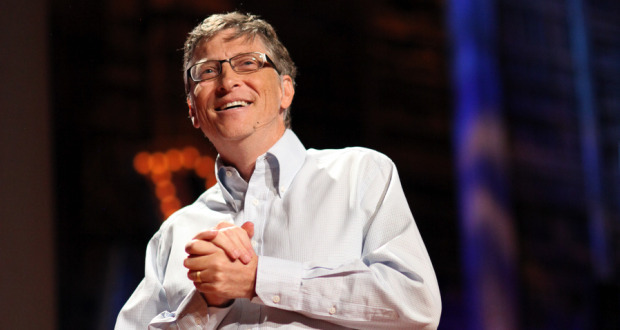 :) Have you ever thought about going to someone like Bill Gates for investment? Scott, yes, if it can get a 4S financed and built within the next few years, then that’d be great, irrespective of whether the TWR ever comes to fruition in a couple more decades. I think the take-away is that Bill Gates ought to be congratulated, and he’s putting his money where his mouth is. The fact that he’s backed the second-placed horse in this race isn’t too important, it’s not that hard to get him on the right horse I imagine, the point is, he’s on a fast horse pointing in the right direction. Thanks for that link to the Bill Gates video at TED. At first I was very discouraged to find that he has bought the idea that rising CO2 concentrations in the atmosphere are dangerous. I was beginning to wish that IBM had plumped for CP/M instead of DOS in 1980 so we would never have heard of Bill Gates. However, after a while I realized that no matter how weird people like Bill Gates (world’s second most wealthy person), James Hansen (Storms of My Grandchildren) and James Lovelock (Gaia hypothesis) may be they all support a rapid build up in NPP capacity. hey gallopingcamel, you’ll get very short shrift here peddling anti-science nonsense. Go away, would you? The company developing the TWR is ‘Intellectual Ventures’..
Is it possible that the main reason they chose the TWR is so they could patent it, whereas the IFR is probably owned by GE or USG? You should be thankful that us knuckle draggers are still trying to learn about energy policy from Barry Brooks even though some of us disagree with his views on “Catastrophic Anthropogenic Global Warming”. Sorry about the plural (Brooks) but you do seem to do much more than one person should be capable of. Thanks gallopingcamel, after that last comment, I’ll no longer look upon the regular pluralising of my surname with such disdain. It’s a fun explanation, even if a little hyperbolic. The [TWR] technology takes a minute amount of enriched uranium (U-235) along with the far more commonplace U-238. After an initial ignition, the wave travels through and uses up the uranium for roughly 60 years.
. The adjective "minute" is not really appropriate. Being a variant of the IFR, the fissile needs of the start-up TWR core will presumably be about the same as for an IFR core — i.e., the initial zone would consist of roughly 20 tonnes uranium per GWe, of which about 20% has to be fissile. The 4 tonnes of fissile could be either U-235 or plutonium.
. The Pu would come from used LWR fuel, in which case the uranium part would probably come from the same place.
. If U-235 were used, the 20 tonnes of 20%-enriched uranium would have to be produced in an enrichment plant, starting with about 750 tonnes of natural uranium.
. The above TWR loading is just a ballpark estimate — I'm not privy to the actual design data.
. Note, BTW, that a TWR is not small. To run for 60 years, a 1-GWe TWR would have to start out with appreciably more than 80 tonnes of uranium in its core. Gates is attempting to once again ride a second or third-best kluge to fame and forturn. 3. It greatly reduces the amount of Cs-137 and Sr-90 (halflife about 30 years, tenthlife 100 years) to be dealt with as most of it decays while the reactor is still running or during the cooling period after it is no longer running. 4. It is a reasonable bet for indefinite storage if that is called for, yet easily recoverable if at some point it is preferable to recycle or move to other storage. The IFR only burns about 20% in a cycle before reprocessing, and also produces a mixture of transuranic actinides that have to be recycled and refabricated. The IFR reactor was just a sodium-cooled fast reactor like previous ones; the “Integral” innovation was the electrolytic on-site reprocessing, which has not been developed to the production stage and would take some time. 2. The TWR likely does have a somewhat positive breeding ratio in the first years of its operation. There is no merit in mining uranium, using it in LWR and then struggling to store it away. Fast reactors and pyroprocessing will make uranium go a long way. Sodium is an additional risk factor in a reactor. It is just too chemically active and a fire risk. Salts and liquid metals should be used inside reactors for heat transport. TWR amounts to a fast reactor with processing put off for long times. Fast spectrum MOS could good if the materials to handle can be managed. Very interesting discussion. There are a number of other safety issues with TWR which I would like to hear about. Does this reactor have control and shut down capabilities? If so how is it going to be done? Shut down capability is an absolute requirement if the sodium can possibly leak or overheat. Once you have shut it down can you restart it? Will it have positive void coefficient if there is boiling or loss of the sodium? There have been almost no successful sodium cooled plants, in fact most have come to a bad end because leakage is almost impossible to repair. It starts with Rickover’s Seawolf (SSN-575) reactor which had to be replaced with a PWR because of maintenance issues.